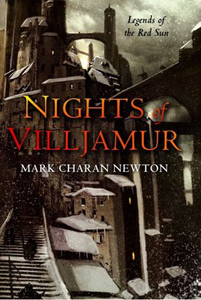 Mark Charan Newton wears his influences on his sleeve, boldly name-dropping the likes of M. John Harrison, China Miéville and Gene Wolfe as driving forces behind his first novel, Nights of Villjamur. But where does that leave me, a self-professed anti-snob – a fan of Terry Brooks and John Scalzi, shy of those more literary works of fantasy, even downright terrified (if forced to be honest)? This was a question I asked myself as I cracked open Newton’s first novel, and I’ll admit I was afraid of the answer. The most immediately jarring asset of Newton’s debut is the prose. Shockingly contemporary, one has to wonder if this tale of political intrigue might be set not on a fictional fantasy world, but in a far future version of our own, corrupted beyond recognition. Newton sets few ground rules with his prose – noirish and moody as it follows a washed up detective tackle a series of mysterious murders; erudite and pretentious when following the leader of a dark cult, tackling the morality behind necromancy; casual and loose as a roguish con-artist ignores every rule of the vicious noble circle into which he is thrown. I’ll admit to struggling with this early in the novel, with the prose seeming to get in the way of the story, but as the novel moves on, Newton’s command of the language tightens dramatically and I started to forget these concerns, instead focussing on the story and characters at hand. The real star of the story is the city of Villjamur, where the majority of the action takes place. It’s clear from the outset that Newton wanted to make a living, breathing environment for his characters to interact in (not surprising, considering Miéville’s The Scar was what convinced Newton to write his own novel) and he succeeds admirably. Villjamur is haunting and brutal, beautiful and edgy, alive yet drowning in its own sin. For every of Villjamur‘s accomplishments, though, the remainder of the world (an archipelago facing an oncoming ice-age) struggles to compete. Where Villjamur is deftly drawn, the archipelago is a nebulous collection of names and people, carrying little weight with me as a reader. Newton does well to avoid the massive infodumps that often plague fantasy novels, but I felt that a bit of scene setting wouldn’t have hurt, if only to give the reader a better sense of the world around Villjamur. The main conflict in Nights of Villjamur comes from the impending ice-age, which promises to wipe out all but the most resilient of the archipelago’s inhabitants. Particularly important to the various story-arcs are a group of refugees, shut out of Villjamur‘s safe haven by a scheming group of councilmen (natch). Unfortunately, these refugees remain faceless strangers who the reader only cares about because, well… because they’re told to. It feels like Newton dropped the ball by not offering a side of the story through the eyes of one of the struggling refugees. Of course, what happens within the walls of Villjamur is at the heart of the story and there the novel succeeds on the strength of its characters. Inspector Jeryd (the aforementioned washed-up and lovelorn detective) and Randur (a young casanova) prove to be the most interesting of the bunch. Separate for most of the novel, their storylines converge in a satisfying manner and it’s easy to look back at the early pages of the novel and marvel at the changes they’ve made as they struggled towards their respective climaxes. Less satisfying, though, are the ‘villains’ – cloudy objectives and bland personalities made me wish for a more scheming-from-the-shadows type. Newton also, inexplicably, sheds light on the identity of the murderer early on in the novel, removing any sort of mystery to Jeryd’s investigation. Oddly, this is a case where I feel the novel might have been stronger with less point-of-view characters (or at least position those POV characters in different places, like among the refugees). Newton keeps the novel moving at a quick clip, eagerly flipping back and forth between view-points and never letting the pace drop. Like many of his aforementioned influences, Newton clearly has something to say with Nights of Villjamur. Sometimes, though, the philosophical ramblings of the characters seemed forced, coming out in abrupt internal dialogue, rather than naturally through the themes and actions of the character. Still, the archipelago is a treacherous place and Newton never lets the reader get bored – a nice change of pace from all the scheming and politics is the military-heavy campaign of Brynd, leader of Villjamur‘s military might, and one of the few who really understands the threats to the nation. Nights of Villjamur is being bandied about by reviewers and publicists as a literary fantasy, delving into the underused Dying Earth sub-genre and written to appeal to those looking for something more from their fantasy. While this is certainly true, I was surprised at how much more there was to the novel from the perspective of a Terry Brooks fan. I was worried I would find a dense, overwritten piece of philosophical literature hidden under a fantasy verneer (think Terry Goodkind’s Naked Empire, but not piss-poor), but what I found instead was a tightly plotted novel that worked just as well as a fantasy novel as it did a piece of introspective literature. In short, it would behoove potential readers to drop preconceptions of ‘literary’ fantasy and give Nights of Villjamur a fair shot. With a more than competent debut, Newton seems smartly poised to tackle a wide swathe of readers with Nights of Villjamur, and his future as a writer is bright, indeed. Nice review, Aidan! I have similar worries, as I come from the same reading “background” as you..but I was interested enough to give it a go, too. Hopefully I like it as much as you did…I am trying to expand my reading boundaries a little bit. Now if that arc would just get here. I can’t wait for you to get your hands on your copy. I’m more curious about what you think of it than anyone else out there, really. I can’t wait either. Its been 4 weeks now, but maybe thats normal since its going from the UK to the US. I also requested 2 other books at the same time, so maybe those are holding it up. I just want it to get here so i can crack it open and start reading. The more reviews I read the more I want this book. Due to space problems I only buy paperbacks. Hopefully there will be a paperback edition buy the end of 2009 or beginning of 2010.